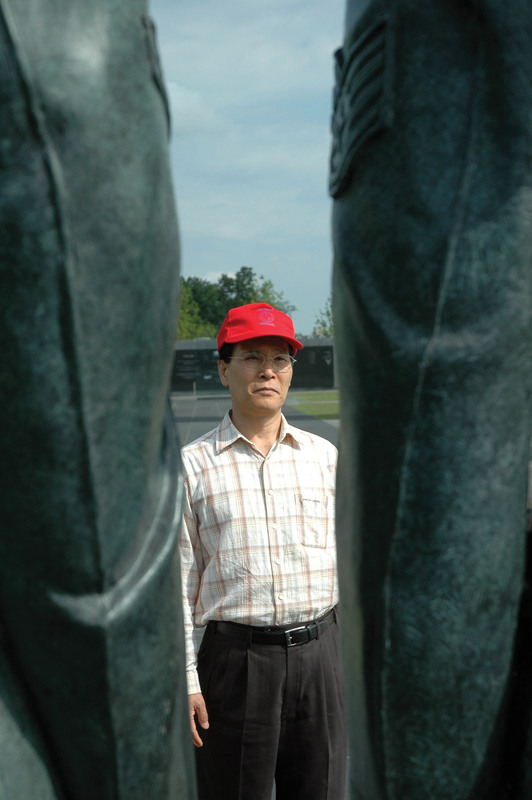 ARLINGTON, Va. (May 24, 2007) -- Dae-O Som, a visitor to the United States from South Korea, wandered the grounds of the Air Force Memorial May 18, looking at the inscriptions that document past Air Force campaigns and marveling at the spires. But this visit to the Memorial wasn't the first time he'd been in Washington, D.C., however. "Around 10 years ago, I visited Arlington National Cemetery by myself," Som said. "It was very strange for me when I found the tomb for somebody who had died in a battle in the Korean War. As soon as I found his tomb, I couldn't move. The tears came down -- I couldn't control myself. It was a very difficult experience for me." Dae-O Som, a visitor to the United States from South Korea, visited the Air Force Memorial May 18. Som says he is grateful for the sacrifices made by American soldiers who gave their lives during the Korean War, to keep freedom alive in that country. Since that time, Som has become a part of the United Nations Peace Forces of the Korean War Memorial Federation, and currently serves as the organization's vice president. The Federation was created to honor Korean War veterans all over the world, he said. "We try to contact them, to invite them to Korea and to honor them, to thank them, and to elevate the meaning of the Korean War," he said. Members of the Federation are now engaged in a tour of countries that had sent soldiers to South Korea during the war there. The group recently held a ceremony at the Korean War Memorial in downtown Washington. "Around 30 American Korean War veterans were there to have that ceremony," he said. "There were also Koreans who fought during the Korean War, about 30 old men, that are living here now. They joined with us, and we had a wonderful day, followed by a banquet here." Som was just a boy, around 6 or 7 years old, when war broke out on the Korean peninsula. He said he remembers the military members that came through his village to help defend his country. "I was at that time a little boy, and I saw many American soldiers, and many other soldiers that came to our country, many with large weapons," he said. "So, even when I was so young, we were very familiar with soldiers." Som also remembers when American aircraft flew over his village, and the messages they brought to his people. "When we saw American fighters and bombers, or sometimes the B-29 (Superfortress), sometime the planes had good news for us," he said. "They dropped small fliers, that floated down to the people. They said what is going on, and North Korea is now retreating, and we can now have hope. It was this kind of good, hopeful fliers we received, when the airplanes were passing." When Som meets American Korean War veterans now, or veterans from other countries that fought in the Korean War, he tells them he is grateful for the sacrifices they made to ensure his own freedom, and his country's successes over the last half a century. "First of all, without their sacrifice, Korea couldn't stand. Today, it has succeeded very much," he said. "My personal feeling about the Korean War is that many American soldiers came to Korea and they sacrificed, around 40,000, during the Korean War. They came to fight and they passed away, they had fallen in our small country, and they didn't even know what country that was before then. We, the Korean people, must honor the U.N. peace forces who fought for Korea." Som said he is also impressed that America sends soldiers to other countries to help secure freedom in those places, as well. During a recent trip to Luxembourg, for instance, he came across the grave of American Army General George S. Patton, a key figure in World War II. "I found General Patton's tomb and his men, about 3,500 soldiers were there, buried there, and I was so shocked," he said. "Those men who sacrificed so deeply for the world, they sacrificed so much to protect the world, for peace. Not only Korea, but Europe. They are sleeping there now, in that place, away from their home country." During his time in the nation's capital, Som stayed in a hotel near the Air Force Memorial. He said he noticed the memorial from that vantage point, and it inspired him to investigate further. "I saw this construction here, from the hotel. What's this, I asked. I was so curious," he said. "So I came out here the other day, with some Korean tourists, and I find out -- this is so wonderful you know? I saw every corner of this memorial. We found many Korean War inscriptions, and the Korean tourists felt they must salute here." Som returned to Korea the day after his visit to the Air Force Memorial, but he will continue his travel to those countries that that sent soldiers to South Korea to fight there. In June, he will visit the Philippines, Thailand and Ethiopia.